Everton, a rural village in north-east Victoria, is 22 km south-east of Wangaratta and about midway between there and Beechworth. It is on the Ovens Highway, in flat to undulating country. About 2 km westwards are the Ovens River flats, on which there is considerable settlement. Everton is situated in Dr G.E. Mackay's Tarrawingee pastoral run (1853-67) and it is thought that Mackay gave the place its name after Everton, England. Everton was situated at a position where it was relatively safe to cross the flood-prone Ovens River plain, making it convenient for miners moving between Wangaratta and the gold fields at Bright and the Buckland Valley. 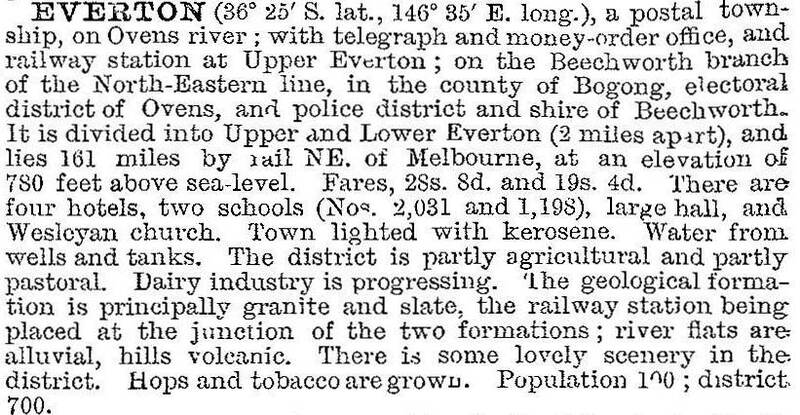 Everton later became a railway junction for the Wangaratta-Beechworth line (1876) and for the line to Myrtleford and Bright (1883 and 1890). The railway station area, 4 km north of Everton, was known as Everton Upper. The schools were at Everton Upper (1871) and at Everton (1870), and the former was closed in 1993. Everton primary school had 17 pupils in 2014. In addition to pastoral occupations Everton has had sawmills and molybdenum mining, molybdenum fetching high prices during World War II. Everton has two churches, a public hall, a hotel, a school, a recreation ground and a caravan park. West of the township on the edge of the Ovens River flats is ‘The Grange’ homestead, built by Francis Murphy who obtained the Tarrawingee pastoral run in 1846. The run and the homestead were disposed of to G.E. Mackay in 1853, who made substantial additions to ‘The Grange’. Murphy became the Speaker of the first Victorian Parliament, and Mackay is commemorated with an annual pioneers' memorial oration. The railway lines to Beechworth and Bright were closed in 1977 and 1987 respectively. Everton is on the Great Alpine Road to Bright and Mount Buffalo, and the railway lines have become cycle paths.